Directions Report Published - Seen But Not Heard? 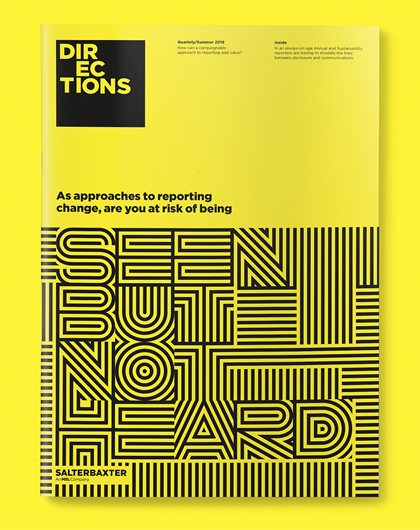 As approaches to reporting change, are you at risk of being seen but not heard? The lines between traditional corporate reporting and communications are becoming blurred. Reporters have a challenge to balance great engagement through compelling stories with the core reporting content. The forces reshaping this landscape are setting new boundaries for how companies communicate their purpose, value creation, performance and impact to the stakeholders that matter most to them. Read our report to find out how we can help. The right solution is different for every business, determined by your starting point, ambition and goals. Whether you are building foundations or looking to break the mould, there are simple steps to activate your report through a campaignable approach - read Directions: Seen But Not Heard? here.